The individual with panic disorder has recurrent, unexpected panic attacks, which are sudden surges of intense fear. There is a highly uncomfortable feeling of being amped up along with a number of physical and/or cognitive symptoms. The person worries a great deal about these events and/or avoids situations where they may occur. Dr. Zuercher-White’s An End to Panic has been awarded The Association for Behavioral and Cognitive Therapies Self-Help Seal of Merit — an award bestowed on outstanding self-help books that are consistent with cognitive behavioral therapy (CBT) principles and that incorporate scientifically tested strategies for overcoming mental health difficulties. 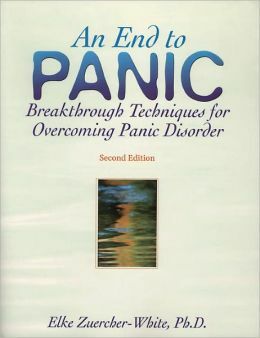 Used alone or in conjunction with therapy, the book offers powerful tools readers can use to jump-start changes in their lives.” width=”260″ height=”338″ class=”size-full wp-image-187″ /> Dr. Zuercher-White’s An End to Panic has been awarded The Association for Behavioral and Cognitive Therapies Self-Help Seal of Merit — an award bestowed on outstanding self-help books that are consistent with cognitive behavioral therapy (CBT) principles and that incorporate scientifically tested strategies for overcoming mental health difficulties. Used alone or in conjunction with therapy, the book offers powerful tools readers can use to jump-start changes in their lives. It is important to note that Panic Attacks not only occur in panic disorder but in a host of other situations, including all phobias, PTSD and the reliving of trauma memories, other anxiety conditions, and depression.